GLOGIRLY: Happy Birthday to ARE YOU KIDDING??? KATIE: Ever have one of those "Worst Birthdays EVER"??? You know, when the only card you get is from the VET??? Did you know that yesterday was my birthday? Neither did the man in brown shorts. It's bad enough that I thought my birthday was in September. Adding insult to injury, I learned that I was not turning 8 years-old, like Glogirly's apparently poor math skills calculated. I turned NINE. NINE!!! Glogirly's got some flimsy excuse about how she never knew my REAL birthday until a few months ago when we all had a pet psychic reading and the psychic needed everyone's birthday for some astrology thing. I TOLD you this was flimsy. So she goes into her files, pulls out my adoption papers and for the FIRST TIME, discovers my real birthday. Oh, and did I mention she's got it written on a post-it note stuck to HER COMPUTER! Yeah, it's been there ever since the psychic reading. Too bad the psychic can't help her find her missing BRAIN CELLS. So the way I see it, I've got NINE years worth of presents coming. WAFFLES: Did someone say presents??? waitacottonpickinminnit!!! Since we cats get nine lives does this mean you're DONE!?!?!?!?!? NO!!!!!!!!!!!! You are nine YEARS, not nine LIVES. Katie! Isn't Waffles nine years of presents all rolled up into one big orange fluff ball? I've had everyone forget my birthday, too and I *still* don't know how old I really am, due to my adoptive family putting the WTF in dysfunctional. I know your feels, lovely one. Happy Belated Birthday! You don't look a day over 5. Faraday: oooh yeah. At our house there's a new tradition - someone has a birthday an' *I* get a gift! Work it, dood. I'm sure there's something in it for you. WORD. Allie: Pfft! Ignore the Brat (I always do). Happy Birthday girlfriend! You don't look a day over 5! Well, happy birthday Katie! I do hope you get nine years of presents! Oh no! Poor Katie! I'm sure Glogirly will make it up to you a thousand times and infinity to you because we all know she is a great Mommy! Gloman will need a little paw tap on his head since he is the one who brought you to Glogirly. Yes you deserve nine presents! I'm sure Waffles will stick his little orange/pinkish nose into them. Happy Birthday Sweet Katie!! Love you lots!! I don't know how you can even LOOK at them! Happy Birdy Day and Best Fishes to our our favorite celebricat! Nine years young Katie, and looking good! The bunny kinda envies you, he's eleven and a half, and he has been feeling all his years for the last four years now. (probably around the time the vet did a little snip-snip.) He has never gotten a birthday card from anyone, including the vet! (but then the vet's card might not be appreciated that much..) Poor guy, now he's depressed, but don't worry, he will turn around in a minute and forget everything again, including his own name. Aah senility. OMC, Katie, you are SO owed!!!! Make sure Glogirly pays up, and pays well! Yup, ya definitely deserve some presents! This is "dating us", but not only do you get 9-years worth of purrsents: but someone else (a human specifically) gets to go through what we used to call the spanking machine about 90-gazillion times or so ... how could she!!! This is dreadful! I can't believe the man in the brown shorts forgot your birthday! This is just SO wrong! Happy Birthday Katie!!! Yes, we think you deserve 9 years of presents for this snafu!!! This is soooooo wrong!!!! You'll have to lock The Orange Monster up so you can enjoy it! Moshe Moshi had and experience like that for the same months; although dude is 7 now. Happy Birthday! ! Poor Katie! Your own human didn't know it was your birthday??? Oh the HORROR! 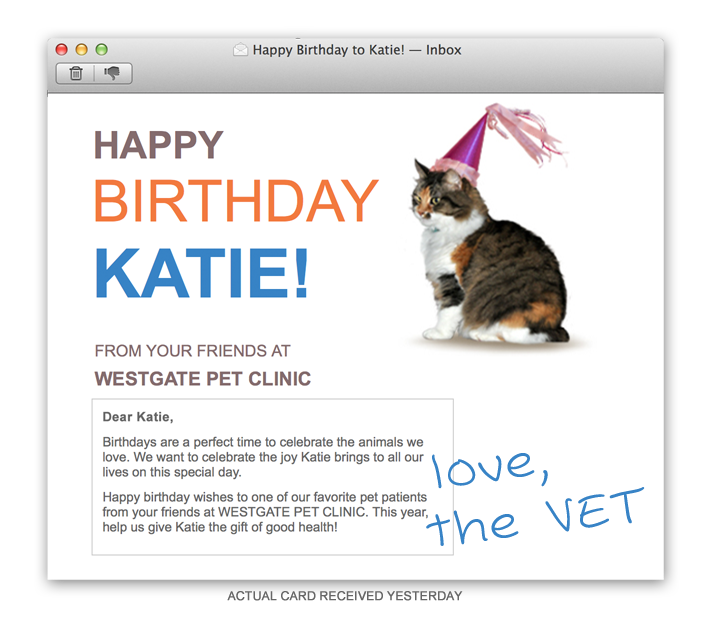 Well, at least the vet remembered......Happy LATE ninth birthday Katie - I bet your human doesn't forget this NEXT year (or else I think a bitey might be in order!). Glogirly missed your birthday? Oh, she owes you, big time! Pierre turns nine later this week, too. We think it's a splendid age. Happy Birthday, Katie! You're looking wonderful. Happy Birthday Katie! We celebrate Gotcha days at our house. My human comes home gives us a catnip mouse and says "here I gotcha a mouse". She's not too with it, at least she feeds us and keeps the litter boxes clean. I guess we'll let her stay;)-Jake. Oh Katie, that's terrible! Not only did your birthday get missed, but you gained a year as well. Truly shocking!! There is a lot of making up that needs to be done. Happy Birthday Katie! Wow....it's bad enough to get one year older but TWO? Sheesh....she owes you BIG TIME! Happy Meowday Katie!!!! Hope you enjoy the day and hav fun. You don't look a day over 5 Katie girl! Give Glogirly a cold sholder, the "bottom of disrespect" and all other approrpiate gestures until you feel vindicated. Or get all the treats you ever wanted. Happy Belated Birthday from your friends in the Cherry City! The kitties feel your pain,Katie. I was always horrible about missing birthdays and most holidays. I finally got the birthdays down this year. The young bunch would not let me get by with a thing. I won't even mention how many years it took! As Scooter reminded me, "It's ONLY once a YEAR, Mom." We see some serious paybacks in the future! Happy Birthday Katie!! Remember it is just a number. ;) And maybe as a present Glogirly will take the orange menace out and you can spend the day with Gloman!! Happy Birthday, Katie. We think you should get double the presents for Glogirly forgetting. No wait, triple! Happy Birthday Katie! Enjoy all your well deserved presents! Happy Birthday, Katie! Well, this is Sunday...perhaps you'll get your presents tomorrow? Pee Ess: I once got a birthday cake with my sister's name on it...if that makes you feel any better. You are so owed lots of prezzies Katie. Milk this for all it is worth! Happy Bird's Day, Katie! Hope your human makes up for her past mistakes! YES YOU DO! We’re the same age. I cannot believe you are the forgotten cat in the townhouse. Everything is Waffles, Waffles, Waffles. My poor BFF! Lookit that sad look on your face. Not even my vet or rescue knows when my exact birthday is. The date that was originally down on the adoption slip would make me 12 years old and I’m NOT 12 years old. HAPPY BIRTHDAY, KATIE! Hope you get your due. HOPE YOU HAVE A VERY HAPPY HAPPY BELATED BIRTHDAY! Maybr your nine years worth of presents will start pouring in. Being a year older than you think isn't so bad, after all, your only as old as you feel!! Well, we could say at least the vet remembered but that won't make you feel any better. Perhaps you can forgive Glowgirly? Humans seem to be missing the gene that reads the calendar. At least Jan is. Oops, we forgot. Happy Birthday, Katie. I agree with the nine years of presents thing.. get on that chop chop.. Happy Birthday from all four of my kitties in Knoxville, Tennessee! MOUSES! And I thought I had it bad with MY peep. Gosh, Katie... they even made you wear a hat. Again I say.... MOUSES! Did you at least get some nip? Wow! Nine birthdays to celebrate! Happy Birthday, Katie! Don't forget your brother....gets left out, of course! Happy Birthday Katie! Our bean has no memory for our birthdays either. We hopes you get all the presents, scritches and lubbins' you want! Happy Birthday Katie. May your day be filled with love and joy. Well Miss Katie there is NO WAY somekitty as beautiful as you could be nine! Five maybe, tops, not nine. At least your mom CARES about your birthday. Our mom is too D#@N lazy to go find our Gotcha Day papers and figure out our 'official' ones. 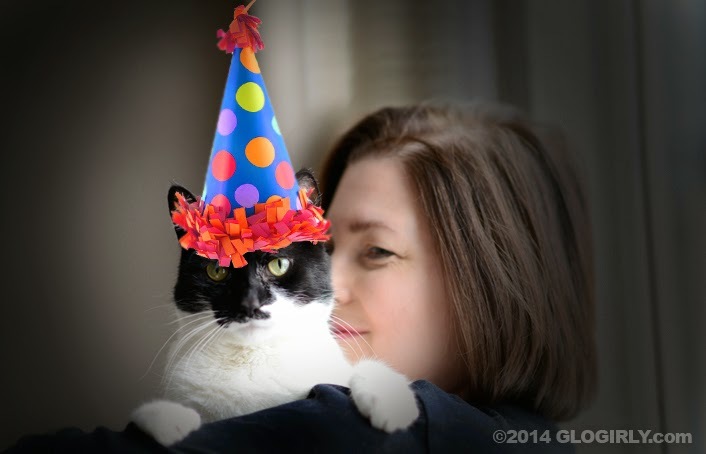 Anyhooo Happy Birthday to one of the most beautiful Tuxie Lady Cats in the Blogoverse! Happy Birthday to you beautiful Katie! Happy birthday, Katie! Now, um, you're going to get nine years of back presents (with interest), right? Happy Birthday to you Katie!! You'd think the psychic would tell you when your birthday is... You don't look a day over 5 to us! Oh Katie!!!!! They missed you bday?! Poor kitty!!!!! Happy Birthday!!!! I hope you ended up have a special belated bday! 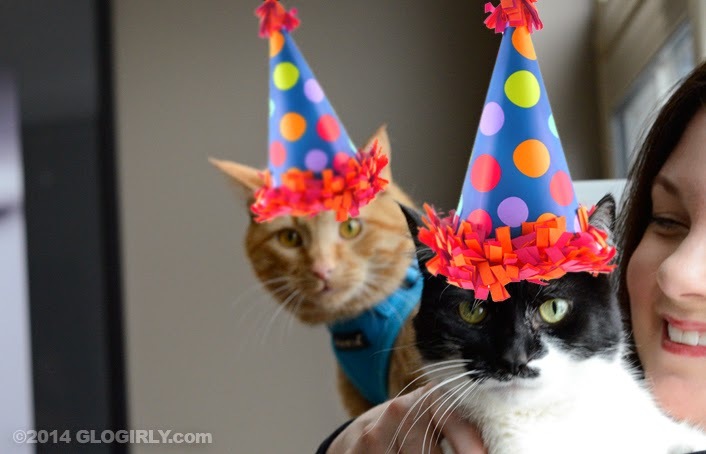 Wow... this really takes the cake... We hope you had a wonderful birthday... and, oh, by the way, please don't tell anyone, but our human forget Zee's birthday last year... Shhh... Purrs from the Zee and Zoey Gang!